External dimension 40x40cm, internal dimension 38x38cm, height 85cm, base 40x40cm, weight 7,4kg. 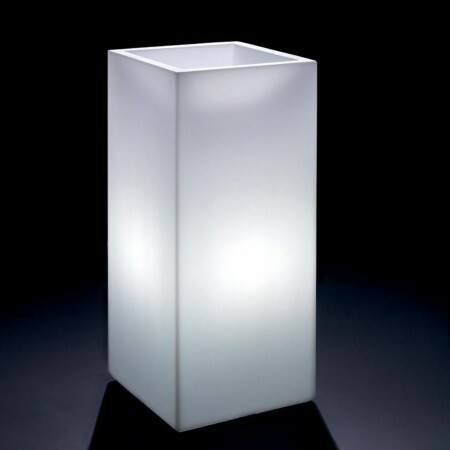 The cachepot Cosmos with light, is able to give a touch of design and modernity to any outdoor area. Its height of 85 cm makes it especially suitable for outdoor environments of large dimensions to place a corner of nature poolside. With modern design, and from the essential lines and clean, the chachepot Cosmos with light, is a high build quality product, a complement that will help make elegant and refined yours outdoor space as well as the interior of your home. The lamp, positioned at the base of the vase, diffuses the light in a uniform and enveloping way within the same, creating a unique atmosphere and welcoming. Recall that this article is also available in the colored version without light. Article visible below in related products. Standard lighting Led system: stainless steel base with 12W bulb at cold white light 6.500°K. Power cord 1,40 mt and German plug / Schuko. IP65 with IP44 plug (bulb not included). Led RGBW kit: working with rechargeable batteries and remote control. Charging takes place via an induction plate. The kit is equipped with grade IP68 and charging base IP20. Illumination duration 10-12 hours recharge time 5/6 hours. The system is able to produce light color white, yellow, orange, red, blue, turquoise, blue, pink, fuchsia, green. In addition, with the remote control, you can set five different programs: fixed light, random, flash, strobe and fade, with further possibility to increase or decrease the intensity of lighting. IMPORTANT: the cachepots, they stand out from ordinary vases for the presence of a drainage kit. System that allows excess water to flow easily without damaging the plant.